Across the US, the demand for inpatient behavioral health services continues to surge, particularly within the child and adolescent demographic. According to a CDC/NCHS study, 6% of youth ages 12 to 19 are being treated with psychotropic medication for a psychiatric disorder or condition. Coupled with research that indicates one in five Americans live with a mental health condition, and that approximately half of all mental illness may begin by age 14, it is incumbent on healthcare designers to strive to work with our healthcare clients to design environments which help destigmatize mental health treatment in settings which are individualized, inspiring, safe and fundamentally respectful of patients and their families. Our team of designers have applied best-practice principles of pediatric behavioral health design for over 20 years, and we continually evolve our approach as a greater understanding of the impact of offering flexibility of treatment modalities within the unit is studied. Our clients are driven to treat the whole child, while addressing their natural coping skills; specifically, distinct social, emotional and behavioral facets of treatment. Recognizing the root of the problem can be biological, environmental and/or psychological, a one-size-fits-all approach falls short. Common care team goals include normalizing the care environment through connections to nature and light; incorporating home-like elements; and, choice - specifically to self-cope in quiet, social or multi-sensory environments as needed. Safety and risk-management are top-of-mind for our clients as they struggle to strike the right balance between security and patient dignity. Thoughtful design strategies allow our clients to achieve the former without sacrificing the latter. 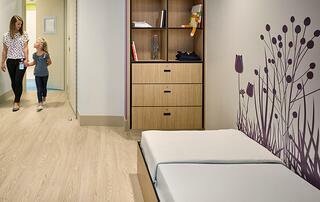 One common challenge is the design of the care team station. Safety instincts, left unexplored, would indicate a glass enclosed configuration may be preferable. However, working with care teams we have successfully configured stations which encourage engagement and are perceived as non-threatening, while supporting retreat and shelter protocols. Our clients indicate that most of their child and adolescent inpatients are direct admits from the emergency department. Imagine, as a parent, the special challenge of coping with the emotional distress of admitting your child to a psychiatric facility, with all the uncertainty, fear and pre-conceived notions associated with dealing with your child, in-crisis. We work with our clients and their family advisory groups to create healing and hopeful environments which help assuage parent’s natural fears and reassure them that their child will be kept safe and treated with respect, empathy and compassion. Pediatric healthcare systems are faced with the fluctuation and variation of patient demographic (age, gender, diagnosis and co-morbidity) which is a special challenge in typical 12 to 24-bed units, making a flexible configuration paramount as they react to census variation. Examples of flexible unit design include multi-purpose spaces which are easily re-configured, as well as a mix of one and two-bed rooms, which can accommodate an overnight family visit or two patients to a room as age and diagnosis allows. We believe art, access to nature and positive distractions all play a pivotal role in creating a patient-centered, healing environment. Art should be relatable, multi-sensory and non-threatening; context is key. 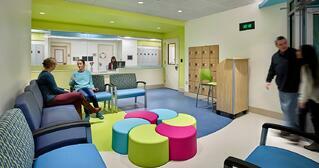 Array recently completed an inpatient unit for Children’s National Medical Center (CNMC) in Washington, DC. Our client expressed a desire to integrate thematic, relatable imagery into the architecture which was uplifting and evoked positivity. Our lead interior designer, Madeline Hill, developed three distinct themes with the expressed goal of creating a strong unit identity as well as reflective of the communities from which CNMC patients are admitted. Three themes: Water (the Potomac River), Forest (Garden) and City (District of Columbia), were narrowed by CNMC care team to a hybrid of Water/Garden/Forest which provided variety and distinction between child and adolescent/teen zones. Since this unit is situated in a busy urban zone, it was particularly important to connect to nature themes, recognizing the universal benefit of biophilic design and our common, intrinsic response to nature. Colors, patterns, textures and images are vibrant, modern and designed to appeal to the youngest (4YO) to oldest (17YO) patient as well as their families. Integrated technology provides opportunities for engagement, learning, entertainment and agitation reduction, which all promote self-stabilization and socialization. Adolescent patients have access to an exercise room, providing an outlet to burn excess energy in a safe, supervised setting. Activity spaces are configured to support one-on-one, small and large group discussion as well as coping sessions. 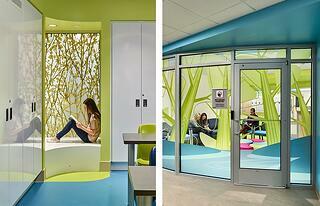 Recessed, encased monitors and projectors accommodate interactive play and learning activities. CNMC’s complement includes a high percentage of patients with an autism diagnosis. A Snoezelen multi-sensory room is used for autism therapy and has wide variety of sensory equipment enabling a therapist to work directly with each patient as together they explore which specific sensation best calms them. Our lead behavioral health specialist, Jon Sell, worked with CNMC to develop a flexible unit design which included a mix of one and two-bed rooms, including five rooms which could swing as census fluctuates between child and adolescent mix. 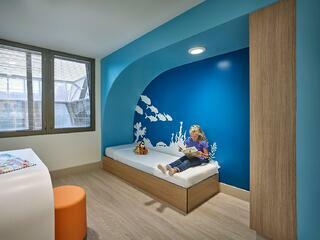 The room design focused on creating a sleeping area that would evoke a feeling of ‘safe-haven’ or cocoon. 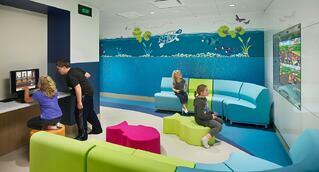 Additionally, patients can personalize their rooms and furniture is incorporated to welcome parent and sibling visits. We expect to conduct a post-occupancy evaluation later this year. In the spirit of Array’s commitment to continuous improvement and knowledge sharing, stay-tuned for a follow-up, lessons-learned blog.